Swedes have flocked to social media to muse at the passing of "the world's oldest European eel", which lived in a well to the age of 155. It was found dead in the southern town of Brantevik when the well owners removed the lid to show it off to visitors, The Local said on Friday. A boy dropped it in back in 1859, when it was apparently common to use eels for keeping well water free of insects. On Twitter, the hash tag "RIPalen" ("RIP eel") has been spawning jokes. Here is a selection of comments on the death of the famous al (eel in Swedish), whose long life was well documented in Sweden. @AngrymanSverige tweets: I'm al shook up..
@Supermiljoblogg tweets: Thank you for al. 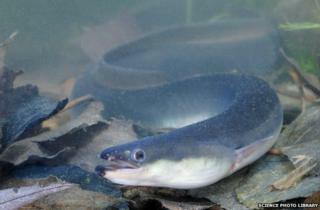 @SwedenDC tweets: Today the Kingdom of Sweden lost one of its best eels. @wistikent tweets (translated): Never forget that the world's oldest eel died under a conservative government.